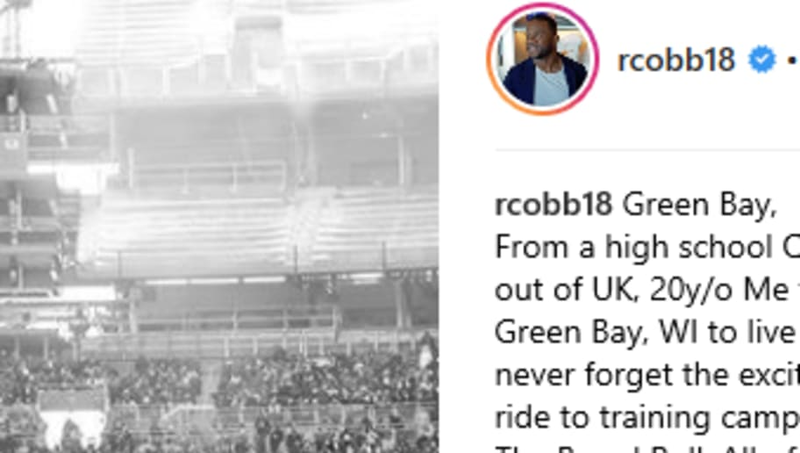 ​Randall Cobb's tenure with the Green Bay Packers​ officially reached it's conclusion this offseason, as the team opted against re-signing him. The separation was official once Cobb signed a ​one-year, $5 million contract with the Dallas Cowboys. "I want to thank the people of Green Bay and the state of Wisconsin for sharing their home with me for the past 8 years," writes Cobb. "I want to thank the organization for believing in me, drafting me, and giving me an opportunity to live out my dreams. I want to thank the many coaches, trainers, strength & conditioning staff, equipment staff, community outreach, marketing, digital, and everyone else I’m leaving out. You may think that you’re just doing your job, but in the process you were elevating me to be the best version of myself." Cobb wasn't the only one to thank the Packers organization and the city of Green Bay. Cobb's wife, Aiyda, also penned a farewell to the city, expressing how thankful she was to start a family in Green Bay. "Green Bay, thank you," writes Aiyda. "We will forever remember you as the place where we shared our first home, made countless memories, and gave us the opportunity to meet friends that will last a lifetime. I will always be proud that our son was born in Green Bay, and I know he will be too. It was truly a blessing being a part of the Packer family. Until next time ❤️." To say that the Cobb family will miss Green Bay is an understatement. That's where the latest chapter of their lives began, and they will be forever grateful. Now, they begin their next chapter in Dallas.